V, my oldest, is four years old. While last year she attended a small Catholic school two half days each week, we decided to join a Catholic homeschool co-op that has a Montessori preschool program for a couple of hours one day a week. but one of the things I’ve loved the most as I continue learning more about the different homeschool teaching philosophies is the emphasis on reading as much as you can and reading good books. As someone who spent the vast majority of my childhood reading books, I cannot wait to delve into some of my favorites so I’ve been eager to start reading longer books aloud to V. However, I also don’t want to put too much pressure on our reading aloud and end up putting her off from enjoying it, so I’ve been cautious with when and which books to start with. *All the below books will be linked with an Amazon affiliate referral link. Please see my full disclosure here. On the recommendation of homeschooling moms all over the place, the first chapter book we attempted to read was Little House in the Big Woods. We read half a chapter every night or two for the first four chapters and we just kind of lost interest. I do hope to go back to it eventually but it just didn’t seem like a good fit for her at the time. She was not quite 3.5 when we started it. The next one we picked up seemed to be a better fit for her age and was a new one to me, My Father’s Dragon. V was around 3.5 years old when we first read it. The chapters are short and easy reads and the characters are silly and fun. It took us about three weeks of reading a chapter almost every night to finish it. At the time we were only reading books in general at bed time. I was still working full time and with Baby A still being a baby at that point with multiple nap times that only happened on me, it was hard to find more time to read. We now read in frequent chunks throughout the day, including during or immediately after breakfast (our attempt to start a morning basket routine), usually during snack time before rest/nap, and then at bed time. After My Father’s Dragon we took a break from that series and picked up Charlotte’s Web. Around this time I also tried to start Ella Enchanted, which is my favorite childhood read. While she enjoyed both stories, Ella Enchanted seemed to be a bit too involved and her attention span was only long enough for a few pages at a time. I was a little surprised because she loves princesses but I didn’t want to push it so we shelved that one for now. It took us about five months to finish Charlotte’s Web. We weren’t reading it every day and we often only read half a chapter at bed time a few times a week. But she enjoyed it enough that she was excited to start another longer book and she has even asked to re-read Charlotte’s Web already. We just finished Elmer and the Dragon, which is the sequel to My Father’s Dragon. It’s very much like the first book in that the chapters are very short, easy reads and the characters are entertaining. The day after finishing Elmer and the Dragon, V really wanted to start a new chapter book but we didn’t have the third book in the Dragon series. I had planned to start The Family Under the Bridge which I had on hold at the library, but we got slammed by an ice storm followed by a stomach bug so I hadn’t had an opportunity to run out and pick it up, so I went back to my shelves to see if I could find anything. I almost picked Ella Enchanted back up to see if she was ready for it but I decided to try The Secret Garden instead. I actually don’t remember reading the book growing up though I have seen the play and I didn’t realize that my copy is actually an adaptation so I think it is shortened to be easier for elementary aged students, but it’s definitely higher than an early reader. In the time it took for me to draft, then edit, then publish this post, we finished it and she really enjoyed it (and she thinks my attempt at an Irish accent is hilarious). Because I am such a book lover myself, I have a really hard time not getting super excited about all. the. books. And then super overwhelmed with choosing which to read next and which is age appropriate, etc. I’ve found so far that if I just jump in to a book and see how she reacts, that’s a fairly good judge of if she’s ready or not. We were recently snowed in with no new chapter books when I found this fairy tale that I remember reading when I was younger. We started it twice and it may have just been a bad time of day, but she never brought it to me and asked to read it, which she had done with both Dragon books, Charlotte’s Web and The Secret Garden. So I haven’t pushed it. I do leave it on her shelf and she even narrated back to me some of what had happened but she hasn’t asked to read more. In addition to chapter books, we have a large selection of non-twaddle-y picture books of varying lengths (mostly pulled from Ambleside Online’s Year 0 list). We also read a story or two from one of our children’s Bibles, read about a saint of the day, read poetry a few days each week and V enjoys spending time with some letter and number wipe-clean books we have. The rest of our day is spent learning life skills (helping me with chores) and free play. 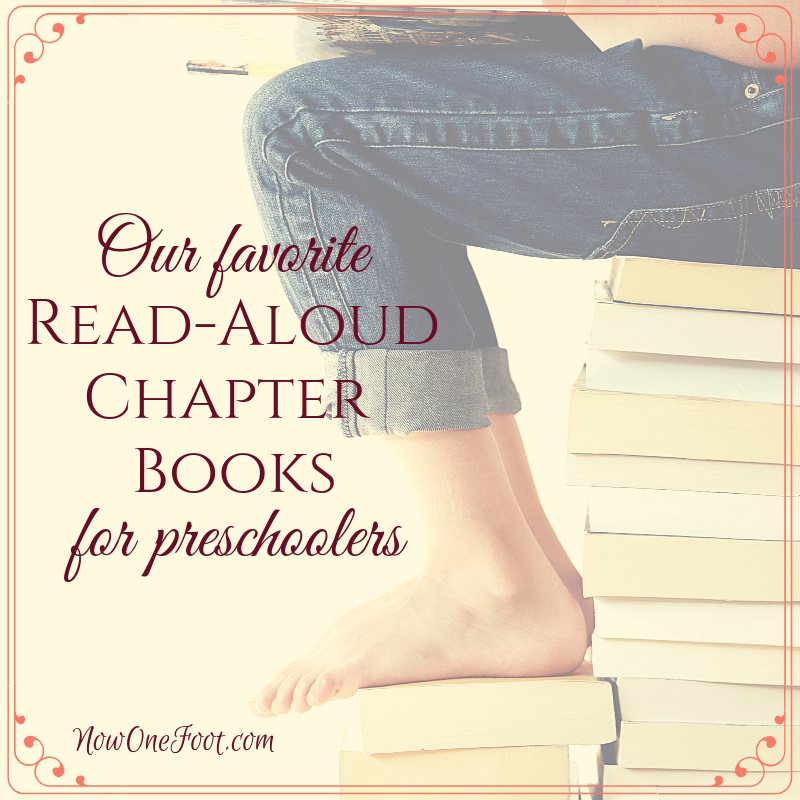 Do you introduce chapter books to your preschooler? What are your favorites to read aloud? Be sure to PIN IT to refer back to later! We love these books! This is a really great list. I love read aloud as you can really pick whatever you want – read above level – no matter the age. It’s so good for them! Yes! When I first started reading about people reading chapter books to their toddlers I was so confused and thought they must have perfect children who loved to sit still. The reality is completely different but still amazing!